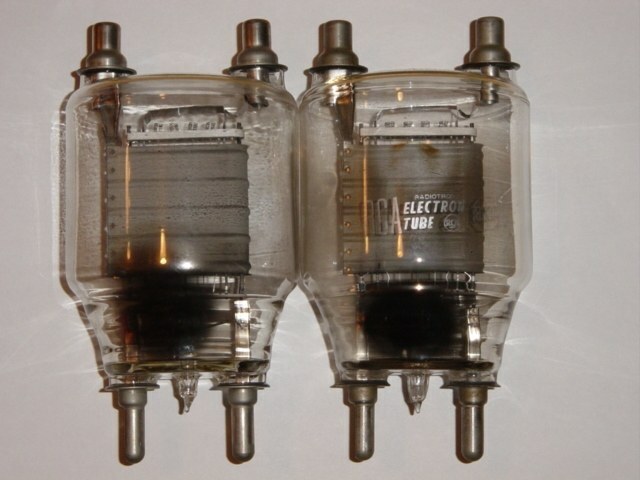 From 1920 to 1960 was the golden age of vacuum tube era. Lots of excellent triodes created from USA and Europe. Some of them originally designed for radio transmitters were widely used in world war II whilst the others worked for audio amplifiers. 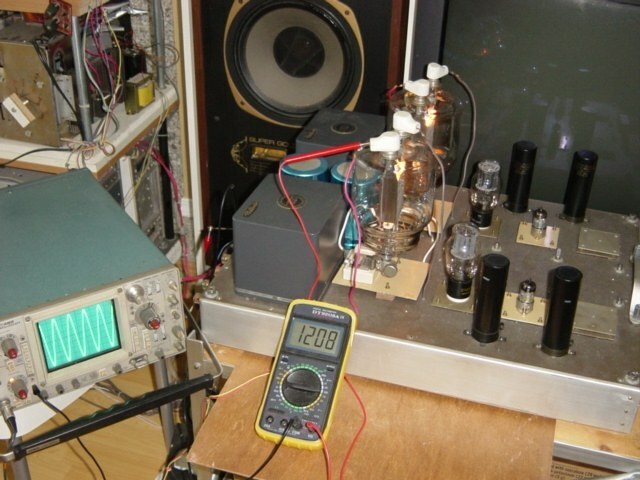 I collect direct heating triodes for fun and, however, they go together eventually to made excellent single end amplifiers. I selected RCA 833A for this project, it was originally designed for 30MHz radio transmitters and also used in X-ray machines. 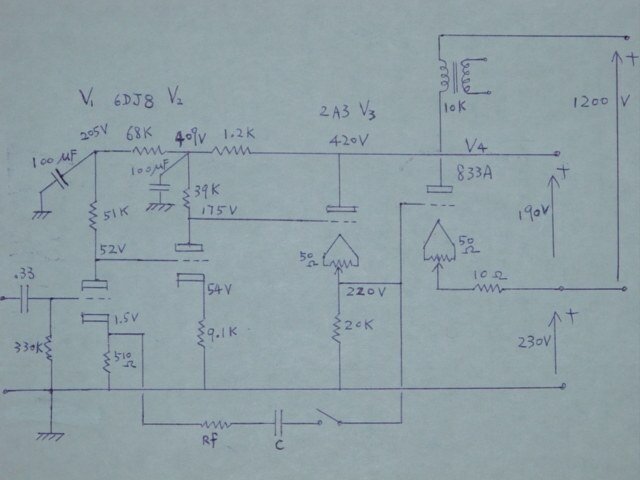 From the very beginning, rare people think about 833A for audio amps. 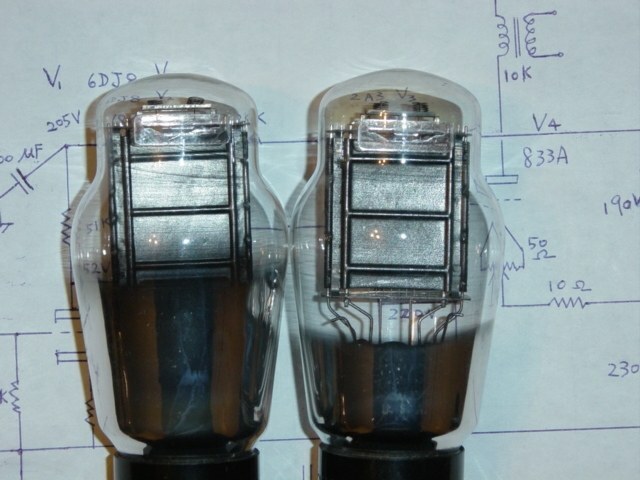 RCA 833A filament supply 10V 10A, Vp 3000V, Pd 1500W. The best 833A ever made with special alloy plate structure. The plate is rigid with less elasticity, does not like other metal plates it will only be broken rather than deformed. It can work normally under red hot plate condition. Very good sound quality! 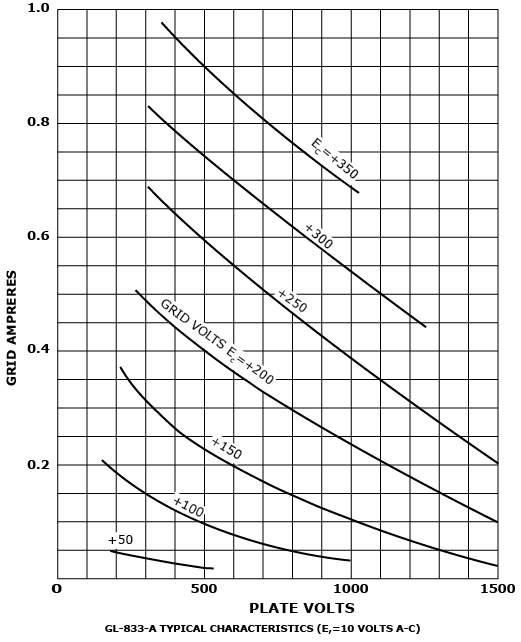 From non-official speaking, the grid works only on negative bias side is called right tube while the positive side is left tube, this is because zero bias is at the center. 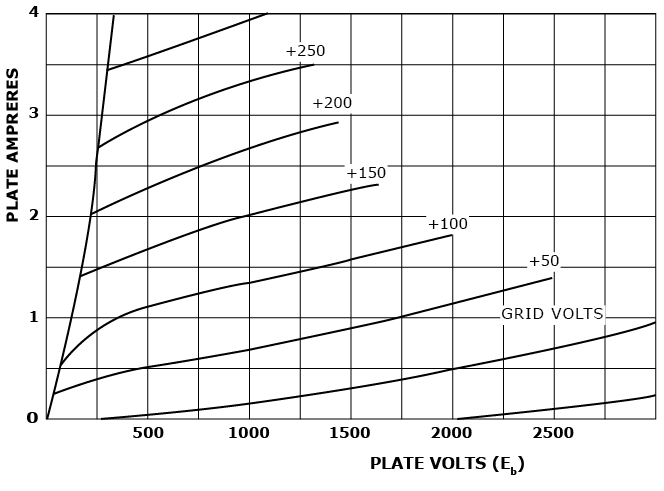 The interelectrode capacitance grid to plate is 6.3 µµf and grid to the filament is 12.6 µµf, this will load the driving tube a lot at the high frequency so that a 2A3 cathode follower direct drive has to be arranged due to its very low output impedance. 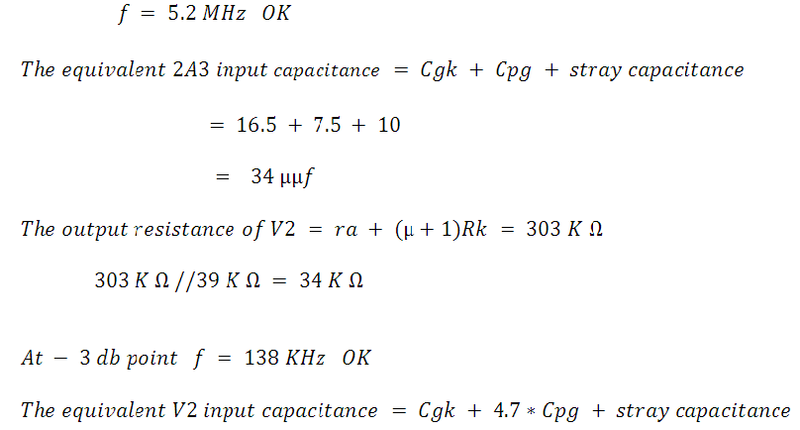 The circuit design is straight forward, all direct couple to output, if the preamp output signal does not include a DC component, the .33 £gf input capacitor can also be taken out. Let’s try -6 dB negative feedback. 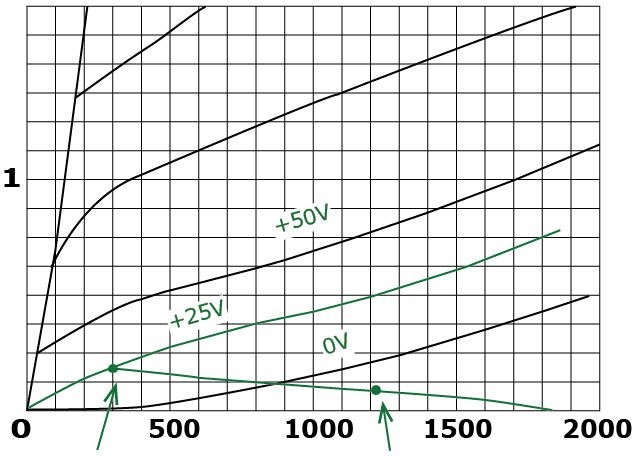 DC filament supply with huge filter capacitors for 2A3 and 833A is a must otherwise it will hum. I also change the driver tube with mono plate 2A3 and WE300B to see what happen, all ok and work normally with their own sound style. Due to all direct coupling the frequency response is totally depending on the output transformer, this machine 25Hz to 55KHz no problem with excellent sound quality. 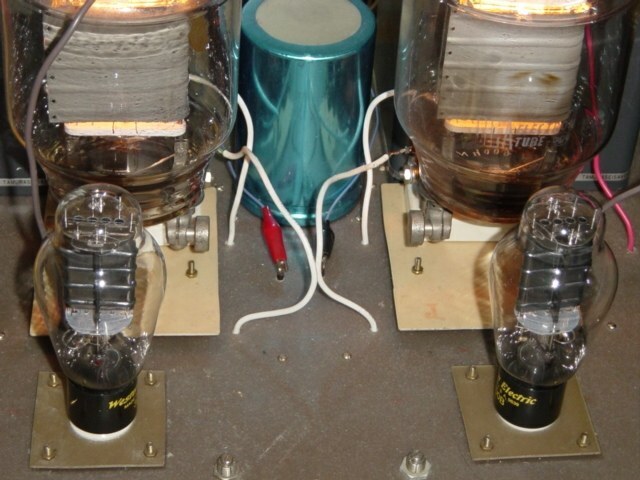 The overall power supply arrangement is a bit more than that of general tube machines as they are independent supplies and the weight and volume are huge. 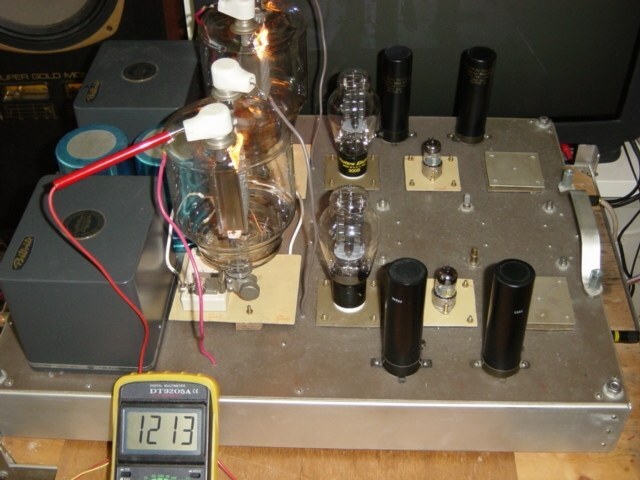 This is the reason why only very rare commercial products use 833A as power tube. I built one that I power with a 1000 Volt power supply made of a Hammond 274 center tap with two fast reacting diodes, a pi filter with 600 Volt rated electrolytic capacitors wired in series and Hammond 193M chokes mounted in plastic because they can’t be grounded. The output transformer is a Hammond 1624SE and I run the grid at ground potential driving it by 5K transformer coupling from a 245 triode. I could not get the filament quiet with a balancing resistor the way you did so I run a 20 Amp 10 Volt transformer to a bridge rated at 50 Amps (a 20 Amp rated bridge heated up and smelled bad), an 82,000 microfarad 25 Volt capacitor, a 50 Watt 0.1 Ohm resistor, and a 4.5 Farad digital automotive capacitor that has to be pre-charged before turning the cathode heater current on. I have been running this since April and it sounds splendid, deep bass and delicate mid and high. I have had no trouble with it so I consider it tried and true. Commercial value of this as you point out is limited but it is vastly more fun than any amplifier you can buy. I would love see you schematic. Would you be willing to share?